If ya’ll come ‘round these parts enough then ya’ll know that I rock with both Camp Lo and Pete Rock big time. So it should come as no surprise that when I found out these 2 were linking up for a mixtape “80 Block From Tiffany’s” I was hype as hell. I won’t hold you though, when it dropped I was beyond disappointed that it was just Camp Lo acapellas over classic Pete Rock beats cause even as dope as an idea that is, I was expecting one of my fave hip hop groups (yeah, I rock with Camp Lo) rhyming over OG beats from one of my fave producers. So it doesn’t take a rocket scientist to know that when I heard that part 2 was about to drop which WAS gonna be what I originally thought the first one was that I got hyped all over again. And if you know me, then you also know I barely get hype for anything that’s tagged “hip hop” nowadays and since I was already let down by the first mixtape, the question of the day is, will “80 Block From Tiffany’s Part 2” be worth getting hype for all over again? And the answer to that question is simply HELL YEAH! “80 Blocks…” sets off with “Ladies and Gentlemen” featuring Talib Kweli and has Pete freaking one of my fave drum breaks with The Whatnauts’ “Why Can’t People Be Colors Too” and I can’t front, the bul Kweli even comes correct on this banger, “describing it so violent, that’s how you turn ‘em off/these n-ggaz is calories, you dancing just to burn ‘em off .” “Starlight Glitz” has Geechi Suede going in on that Camp Lo ish like nobody else can with lines like, “coco cola fetti clips, monster rolling chevyness/circle ‘round the universe, smiling at the dangerous/brass monkey bottle bliss, crack window scandalous/shay butter bonanza, magic handle out mozaliff/heavy on the ankle twist, trey eight banana shift/the block is just a candle whip, mountain off the scandal sh-t”….WTF?!?!?!?! I don’t know what Suede just said (in fact, money had to had to make up at least 8 words in those 12 bars right there) but it sounds dope, so who cares? “Clean Getaway” featuring Uncle Murda is a collabo I wouldn’t expect from the Lo but Murda mos def sounds at home with these cats while “Let’s Toast” and “Glitter and Gold” have a more laid back vibe to them but both still bang. “80 Block Party” has an ill afro beat feel to it that reminds me of one of my fave INI jawns, "Grown Man Sport"that Pete produced back in the days and has the Lo explaining what could happen to you back in the days at a NYC block party. “Don’t Ya Just Love It” featuring Ab Soul, “Bionic” and “For The OG’s” all have Pete lacing Camp Lo with the perfect soundtrack for Geechi and Sonny to spit that 70’s lingo over while “Megan Goode” featuring Mac Miller STAYS on repeat. “No Uniform” featuring M.O.P. is another collabo you wouldn’t expect from the Lo but the way Pete freaks the “Killing Fight” off "The Big Boss" soundtrack (made famous by Dialated Peoples for “Work the Angles”) there’s absolutely no way you could front on this and “You’ve Never Seen A City (Like The Bronx)” is flat out beautiful and lets you know the difference between cops in the Bronx compared to cops in any other boroughs in NYC. But my fave track on this album is easily “Love Traps” featuring Tyler Woods where Pete freaks the Foster Sylvers “Misdeamonor” sample (made famous by The D.O.C.’s “Funky Enough”) and makes the sample his own. I can’t front, when I first saw this jawn had 25 songs on it, I thought that’s A LOT of room for error (I personally feel no album/mixtape should have over 14 songs on it.) but I should’ve known better with Pete behind the boards. Not saying that there aren’t a couple of jawns on here that’s just “aiight” but on a whole “80 Blocks…” bangs from start to finish. To be honest, “80 Blocks…” is probably one of the best produced albums I’ve heard in a minute. And when I say “produced” I don’t just mean the boom bap of the album but the project as a whole. 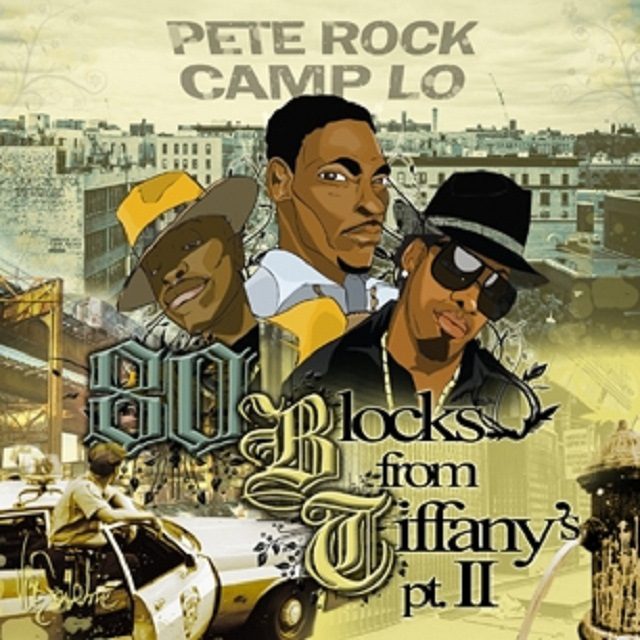 If it’s not a dope beat, then it’s an ill sound byte that Pete dug up to match the mood of the song and if it’s not an ill sound byte then it’s a dope interlude with Pete and Camp Lo explaining how “80’s Blocks…” came together. Now I know some cats will front on this jawn on some ole “I don’t know what these cats are even talking about” and you know what? I don’t either...but again, who cares? I also don’t know what D’Angelo is mumbling about half the time but the ish sound dope right? Welp, it’s the same thing with Camp Lo. I don’t know what these dudes have been talking about for the past 16 years but for me, if it sounds dope, then you’re good money with me. And you can best believe that if you love hip hop that “80 Blocks From Tiffany's” will be good money for you too.